The sound of the bagpipes at Biggin Hill Airport has heralded a revival of the renowned “Caledonian Girls” of British Caledonian Airways (BCAL) in aid of charity. The occasion, their first official reunion in 10 years, was an aircraft-naming ceremony. 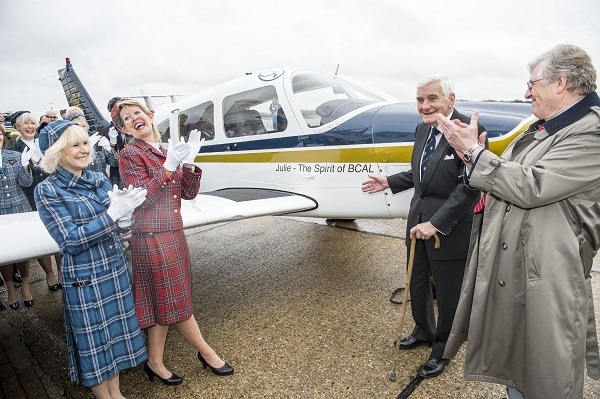 A Piper Archer (G-RECW) in the colours of the former Scottish-flavoured international airline was named “Julie – the Spirit of BCAL” in memory of former staff member Julie Washington by Alastair Pugh (in the dark suit), the former managing director of the airline. Julie was based at the airline’s Heathrow transfer desk for many years. She was diagnosed with cancer and received what colleagues called outstanding care at the Phyllis Tuckwell Hospice in Farnham. She died last year. The Piper, funded by Robin Washington in memory of his wife, will be used to raise funds for the hospice and the Golden Lion Children’s Trust, formed by BCAL staff members in the early 70s to provide help and support for distressed and disadvantaged children. Early fundraising in support of the launch occasion resulted in a cheque for £3,800 for the hospice and £1,500 for the trust. In September, Alistair Pugh hopes to take to the air in G-RECW to celebrate his 90th birthday.